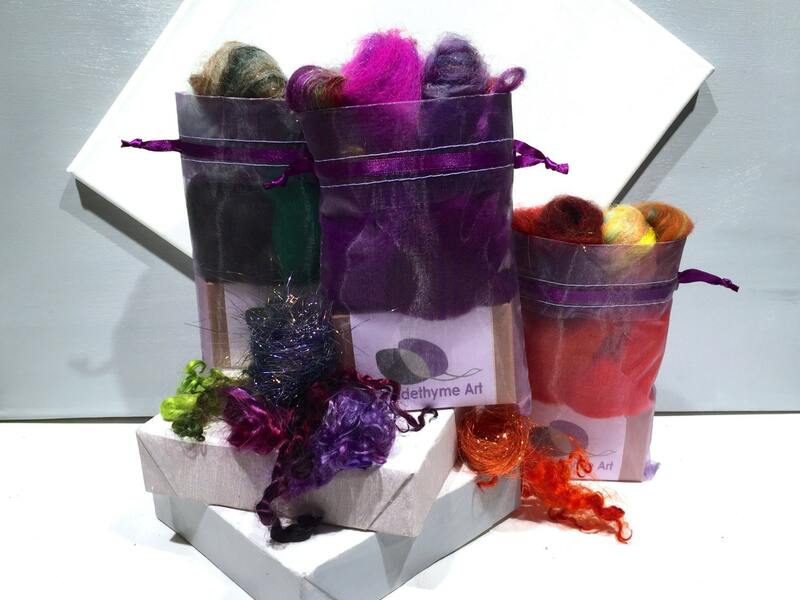 -- Purple drawstring organza bag -- for felting and gifting! --- If you keep the shavings (by working over a plate or bowl) you can smash them in your fist and then into the main bar to further change the soap shape! 2. Blend the desired wools with the desired colors and/or embellishments so that the wool will trap the non-wool elements. --- If you are a needle felter, you can lay it out the wool and needle felt it flat and then an image into the wool before proceeding to the next step. 3. Wrap a thin layer of this blended or felted wool around the soap until it is covered completely. 4. Here comes the trickiest part! Very carefully, insert the wool and soap bar into the organza bag and close the drawstring. Fold the bag over so that the soap and wool are snug and hold it this way while working. 5. Briefly wet organza bag w/soap in a bowl of warm to hot water. Roll soap between hands to build a lather. Continue this action, wetting the soap again as needed, for about 4-7 minutes until the soap is completely felted. You'll know it is ready if you try to pinch the wool through the stocking and the wool is firm. If it forms a tiny "tent" give it another minute or two of agitation. 6. 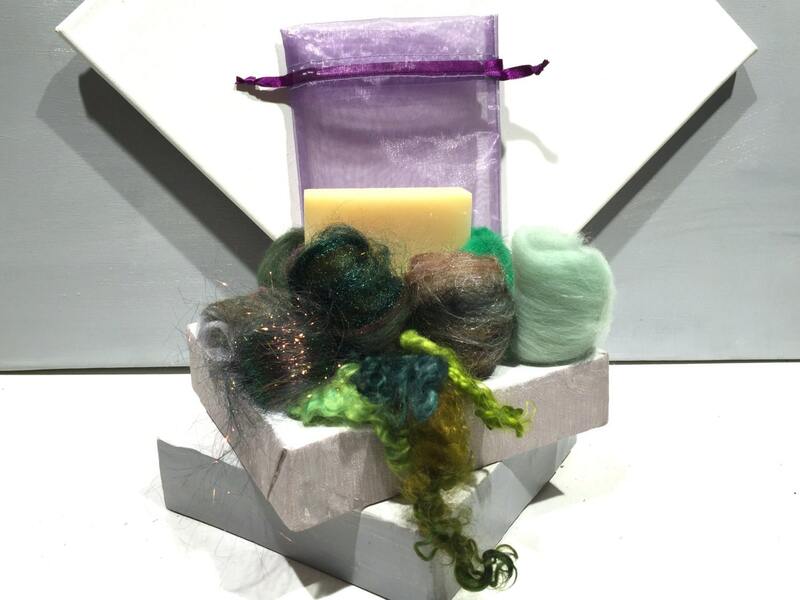 Remove felted soap from bag, allow both to dry. 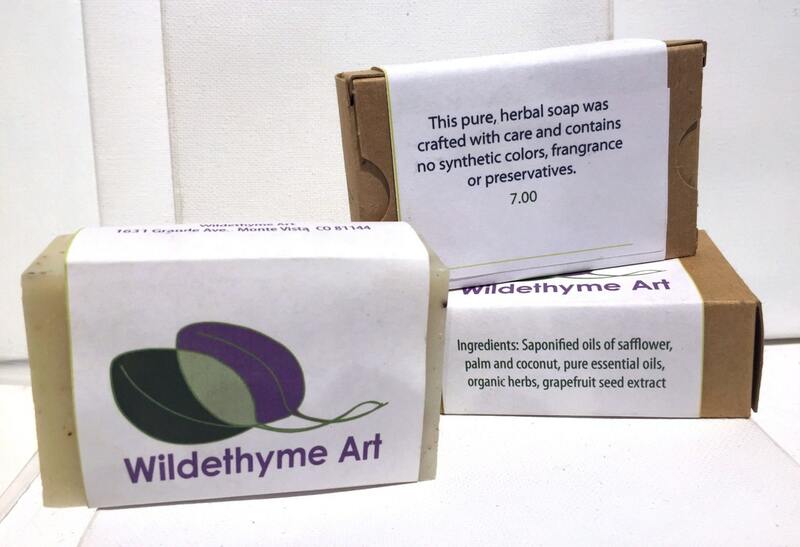 If your soap is too fuzzy for your liking, you can wet it again and agitate/felt it further later. You can also use a sweater shaver to "de-fuzz" it. 7. If you would like to use your organza bag for giving, lay your organza bag out flat to dry. You can iron it with a warm-not hot-iron to remove any wrinkles. *** Keep in mind that you need far less wool and embellishments for the process than our photos may/may not illustrate. 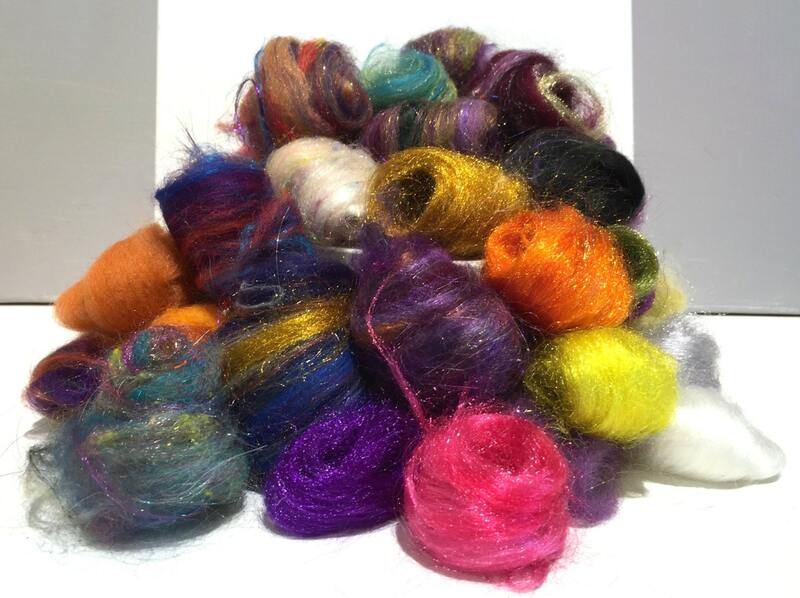 Photos are meant to show some of the fiber possibilities. *** If you are very sensitive skin, you may want to forgo sparkly fibers as they may be too rough on your skin. Let us know you want us to leave them out. We understand if you want them for another project too! Lovely kit, great gift for a friend.